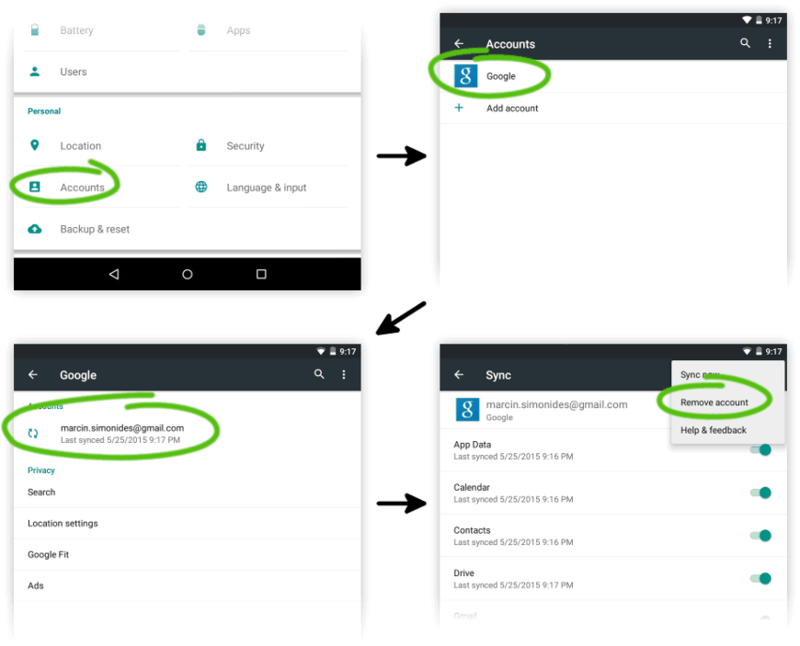 Both modes aim at confining the user to within the app to protect him or her from the complexity of the Android system and other apps. The full kiosk mode is much more robust than the simple one (see the video below) but it is also more difficult to set up, the exact steps are described below. 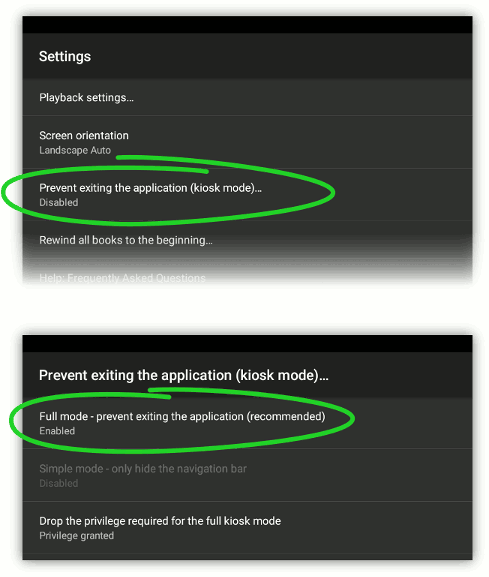 Requirements: The full kiosk mode requires Android version 5.0 or newer and it cannot be enabled on a Kindle Fire. Older devices and Kindle Fire are limited to the simple mode only. 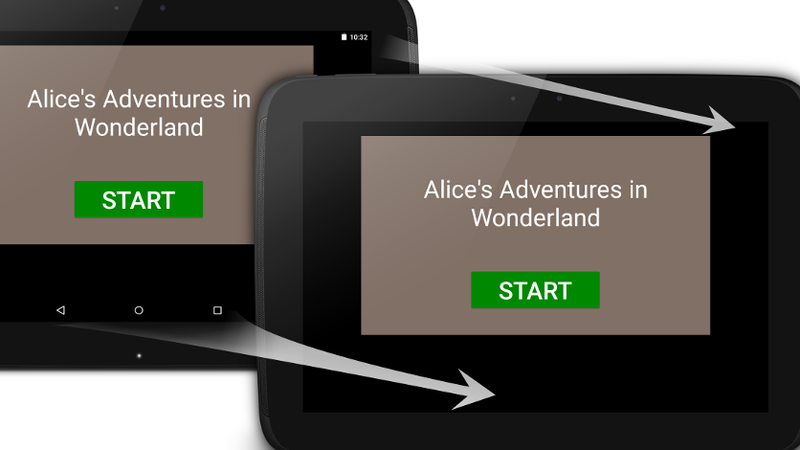 A tablet or smartphone with Homer Player already installed and configured. A PC or Mac computer with Internet access. A USB cable to connect the Homer Player tablet to your computer. In order for step 4 to succeed, you need to remove all the accounts registered in the system. Go to Settings → Accounts and remove all the accounts. You need to enable USB debugging on the tablet so that it accepts commands from your computer. 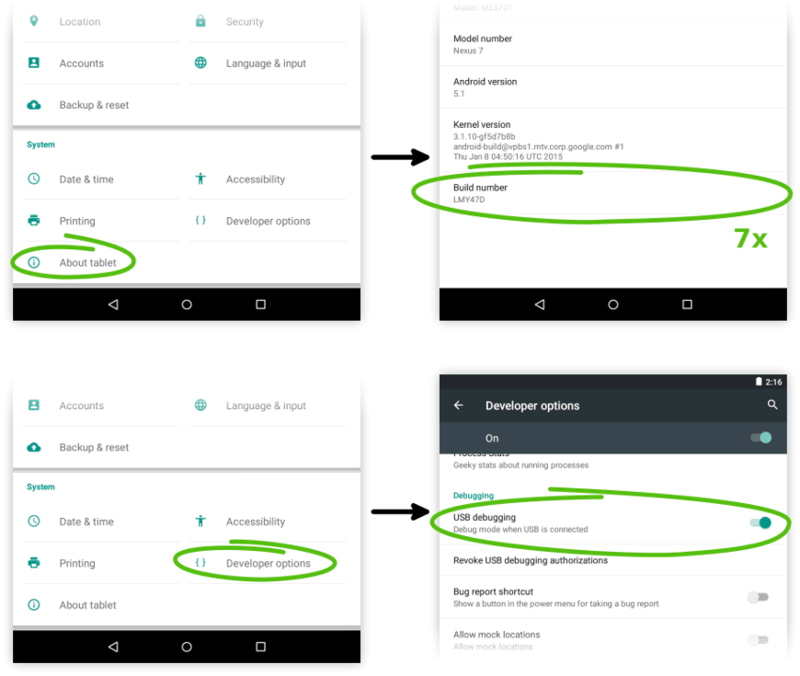 Go to Settings → About tablet and tap on the Build number 7 times. Go back, enter the newly added Developer options and activate USB debugging. The adb command is needed on your computer to perform the next step. The software installed here can be uninstalled later. Download and install the (unofficial) package from this post. If you prefer, you can of course install the Android SDK Tools or even Android Studio but it's a bigger download and more work. In order for Homer Player to take full control of the UI it needs to be given special privilege - it needs to be made a so-called device owner. This doesn't change the software in any way, it does not void the warranty and it can be easily reversed. Attach the device with a USB cable to your computer. On your computer start a terminal (Linux/Mac) or the command prompt (Windows). In case of errors see troubleshooting. If you get this error on a Windows computer then it's probably a problem with a driver for your tablet. Installing a universal ADB driver should help. Error: Trying to set device owner but device is already provisioned. This means that there are some accounts still configured on the device. Make sure you have performed step "1. Remove all accounts" correctly. Now you can enable and disable the full kiosk mode at will. Tap 5 times on the screen to enter settings. Tap Prevent from exiting the application (kiosk mode). Go back to leave the settings screen. Now it's impossible to leave the player application (you can revert this by disabling the "Full mode..." option).